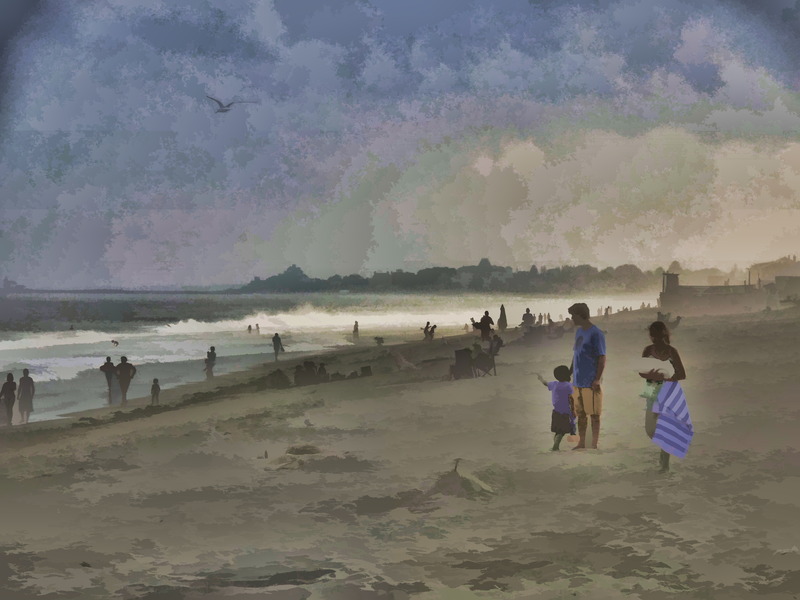 This blog doubles up as a portfolio of painterly photographs from the series that I call iphotoimpressionism. Essentially these are photos of watercolor, pen & ink, and watercolor washes, as well as pastels. As an evolving artist, I try not to get caught in the right or wrongness of a piece. In a sense everything that I do is abstract. * Art and creativity are among the finest example that we have of sublimation. Art performed as a spiritual exercise is meditative, it is mind calming and it stretches to what we want to know of truth and beauty. Everyone can and ought to be creative. It is down-stream and easy. A sign of a well-analyzed person is the ease with which that person attempts many new things from many new perspectives. Whichever method we use to advance ourselves closer to the Universal Laws that govern human growth and development, we find that a well-balanced raft, smoothly gliding down-stream is a delight. It is Tom Sawyer, it is Love in the Time of Cholera, It is the Shenandoah Valley and Old Suwannee River. It is Canada. It is about that feeling that we get when we know we are in touch with the highest powers in the Universe. It is that sensation of knowing that we are alive and aware of loving the vitality. Writing with light has grown from a variety of perceptions and channelings that includes far more than what the eye can see. The New Perspective is a glimpse into life beyond resistances–not exactly a wild abandon, but rather a cooling disposition that everything will be all right. Creativity is alive with the possibility of pleasure and a self-indulgence that is not destructive, but constructive, creative pieces that describe your personal perspective. Nothing is right and nothing is wrong. This web/blog will display my favorite photographs, water colorings, or pen and inks. Most of the paintings found below will have been photographed and imported into a digital darkroom where I re-style the image using a variety of multi-media digital art tools and brushes. I work mostly with The Topaz Studio products, but not exclusively. Please feel free to comment on any of these pieces and I am always happy to share the process. Please Write anytime. My other favorite hobby is Conversation.